3 bedroom, 3 bathroom with Gulf front views. Sleeps 8-10. Beautiful décor. Landscaped gardens. Sleeps 8. 10 minute walk to The Sandbar Restaurant. 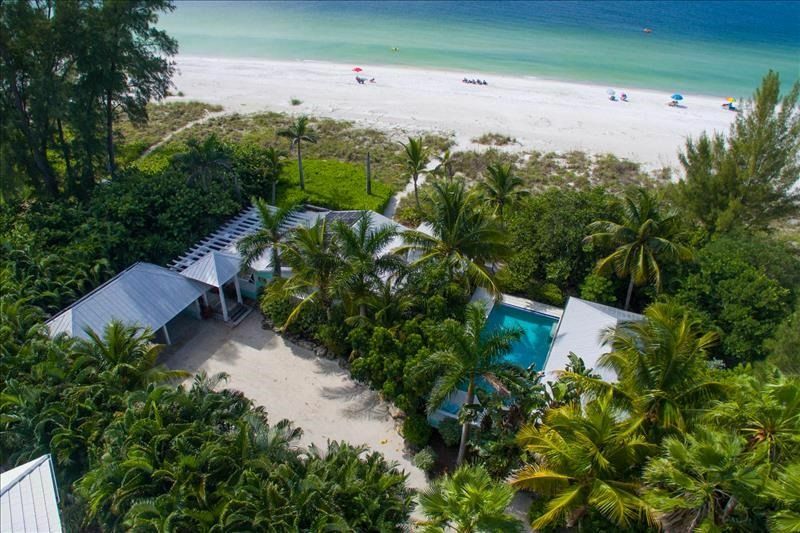 In the most exclusive beach locations, Limefish is one of the most popular rentals on Anna Maria Island. Step down from the front deck onto the stunning white sand of Holmes Beach, where the views across the Gulf are nothing short of spectacular. And at night, you can take up front row seats and watch the magical and infamous Anna Maria sunsets without having to leave your home! Inside, the open plan living space, beautifully decorated, is spacious, yet cosy, with picture windows across the front of the house looking out toward the beach. Limefish has 3 bedrooms: 2 double rooms, one with en-suite and a third with 2 sets of bunk beds, which is perfect for sharing children. Outside, is a large, completely secluded private pool, set in landscaped gardens, with all the outside facilities you need - his and hers outdoor showers, gas grill and cabana with a dining table, to enjoy life outdoors! Limefish is the perfect home from which to truly experience Anna Maria. Walk along the shore to the north of the island, to the Sandbar Restaurant, Bean Point, City Pier, and the boutique shopping of Pine Avenue. Popular for groups of friends and families and also couples - it is a particularly popular home for honeymooners, Limefish welcomes back guests year after year. Fall in love with Limefish and experience the truly wonderful beach life of Anna Maria Island. Love to fish, dive, and be on the water. There is something about waking up on the beach. The Anna Maria Island Trolley is a great way to tour the island, transporting you to all your favorite restaurants and shops. The trolley is FREE! Just one more reason you don’t need a car to get around on our intimate 7-mile island. You can even load your bike on convenient racks provided at the front of the trolley. We really enjoyed staying here. Although, right on the beach, it is totally private. The pool is really nice. For thousands of years, humans have cast their nets on the sand flats and barrier islands in and around Anna Maria Island. Anna Maria’s location at the mouth of Tampa Bay has made it an important part of the history of the Gulf Coast, and the United States. It is one of a string of barrier islands along Florida’s West Coast, including Marco Island, Sanibel Island, Gasparilla Island, Casey Key, Siesta Key, Lido Key and Longboat Key. Ladle-shaped Anna Maria Island is actually three cities, Anna Maria to the north, Holmes Beach in the middle and Bradenton Beach to the south. Each of these Manatee County cities has a slightly different identity, but all share the same relaxed feel, and the same beaches. Of the three, Holmes Beach is the largest, and has the most activity, including our island Publix.